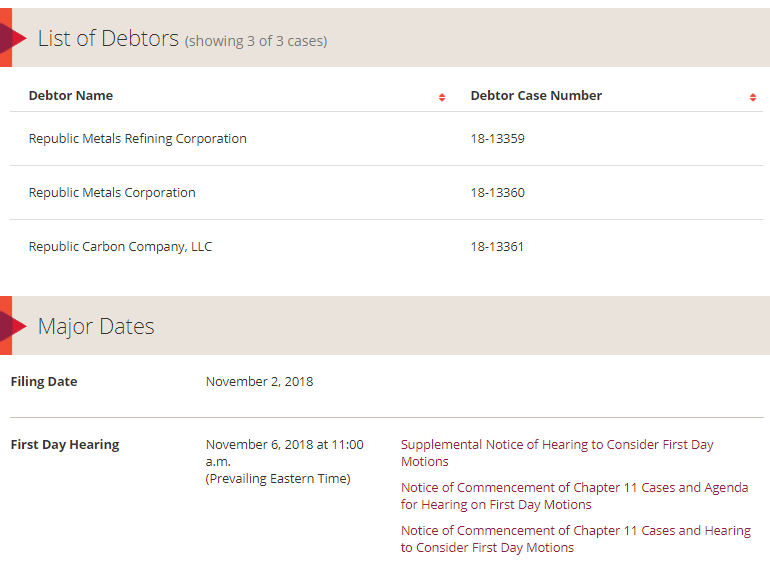 New York— November 7, 2018 — Republic Metals Corporation (RMC), a gold and silver refiner and private mint, filed for Chapter 11 Bankruptcy on Friday. Additionally, records indicate that the company discovered in April some inventory problems. Problems included over $90 million missing from significant inventory discrepancy. RMC has between 1,000 and 5,000 creditors. 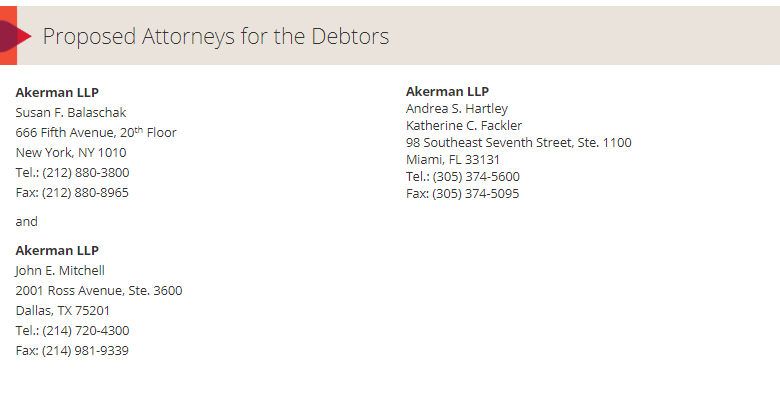 Hence, Liabilities are at $265.1 million and assets are at $174.7 million. Additionally, RMC has $86 million in metal obligations. RMC has filed under three names– Republic Metals Corporation, Republic Metals Refining Corporation, and Republic Carbon Company, LLC. 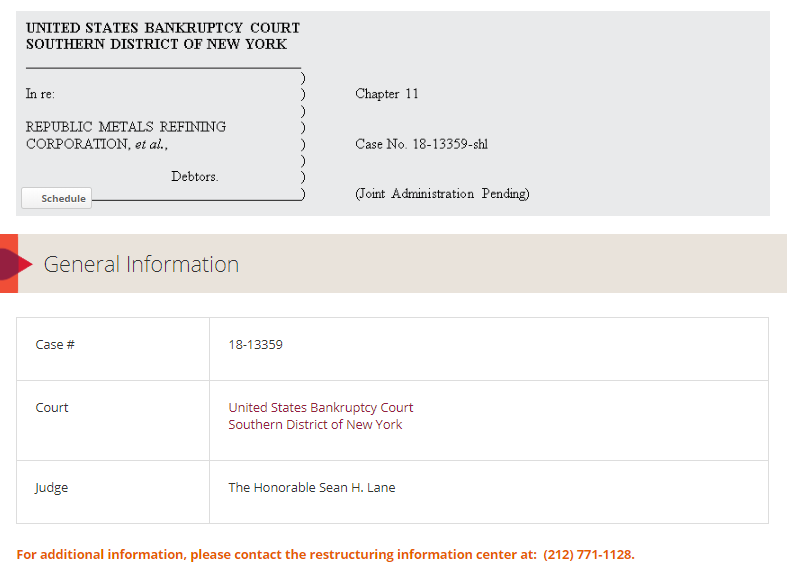 The Southern District of NY of the United States Bankruptcy Court will hear the case. You can view more details on the case here. Founded in 1980, RMC refines over 7,000 tons of gold and silver each year. Therefore, they are one of the biggest Gold and silver world refineries in the world. RMC is also an environmentally friendly company with an LBMA “Responsible Gold Party” designation. Their website mission statement reads “To provide the highest quality precious metals refining services & products…” You can learn more about the company here. Although we don’t yet know what will happen with Republic Metals Corporation, you can be assured that Bullion Exchanges will keep you up to date with the latest news. Bullion Exchanges is a trusted Precious Metals Retailer located in the heart of New York City’s Diamond District. We offer a wide selection of products. Our products include metals that range from the ever-popular gold and silver to the newly emerging platinum and palladium. We appeal to 1st-time buyers and long-term collectors. Stay tuned for additional news on RMC.